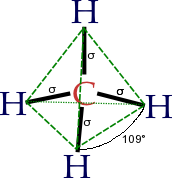 Structure of the methane molecule: the simplest hydrocarbon compound. Organic chemistry, chemistry ke bhittar ek sub discipline hae jisme carbon ke study karaa jaawe hae. Ii panna ke 10 November 2018, ke 11:50 baje, pichhla time badla gais rahaa.